Juan Guaido, the leader of the Venezuelan opposition-run parliament, proclaimed himself on Wednesday 23 January 2019 the country's acting president, turning from a little-known politician to a major threat to the Nicolas Maduro just in three weeks. Just a decade ago, Guaido was an engineering student, while by 2019 he was viewed by thousands of protesters in Venezuela as the country's leader. Guaidó has common mestizo features like most Venezuelans do, and seems like a man of the people. While Guaidó seemed to have materialized out of thin air, he was in fact the product of more than a decade of grooming by US government regime change factories. Among a cadre of right-wing student activists, Guaidó was cultivated to undermine Venezuela’s socialist-oriented government, destabilize the country, and eventually seize power. Though he had been a minor figure in Venezuelan politics, he had spent years quietly demonstrated his worth in Washington’s halls of power. Juan Gerardo Guaidó Márquez was born on July 28, 1983 in the Venezuelan port city of La Guaira, one of seven children of pilot Wilmer Guaido and his first wife, Norka Marquez, a teacher. In the early 2000s, his father was among the first wave of Venezuelan emigres. When Guaidó was 16, he witnessed one of the worst natural disasters in Venezuela’s history. In December 1999, the state of Vargas, where Guaido lived, was hit by severe flooding. As a result, tens of thousands of people died, including many relatives and friends of the future opposition figure. Guaido and his family survived the Vargas tragedy, although people close to him reportedly say the government's ineffective response to the tragedy drove him into politics. Years later, Guaido was dubbed "survivor" by the Venezuelan media — an allusion to the 1999 Vargas tragedy. In 2007, Guaido graduated from the Andres Bello Catholic University with a degree in industrial engineering. He was one of the board members of the university's student engineering center and was recognized for his outstanding academic achievements. Guaido continued his studies and obtained master’s degrees in public administration at the Institute of Advanced Studies in Administration in Venezuela and at the George Washington University in Washington DC in the United States. in 2007, when Guaidó graduated from Andrés Bello Catholic University of Caracas. He moved to Washington, DC to enroll in the Governance and Political Management Program at George Washington University, under the tutelage of Venezuelan economist Luis Enrique Berrizbeitia, one of the top Latin American neoliberal economists. Berrizbeitia is a former executive director of the International Monetary Fund (IMF) who spent more than a decade working in the Venezuelan energy sector, under the old oligarchic regime that was ousted by Chávez. Guaido became involved in politics while still a student. In 2007, he led student protests related to the closure of the Radio Caracas Televisión (RCTV) broadcaster, which was in opposition to the government of the then Venezuelan President Hugo Chavez. This privately owned station played a leading role in the 2002 coup against Hugo Chávez. RCTV helped mobilize anti-government demonstrators, blamed government supporters for acts of violence carried out by opposition members and banned pro-government reporting amid the coup. The role of RCTV and other oligarch-owned stations in driving the failed coup attempt was chronicled in the acclaimed documentary The Revolution Will Not Be Televised. Guaido actively participated in the movement against the constitutional referendum that amended the country's main law to launch Venezuela's transformation into a socialist country the same year. 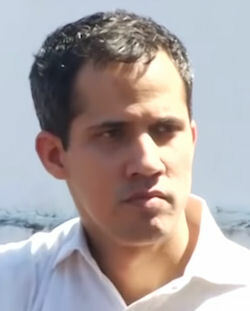 Guaido, along with other local leaders, became a representative of the so-called Generation 2007, a student movement, whose members expressed their concerns over the situation in society. In 2009, Guaido, along with the former mayor of Caracas, Leopoldo Lopez, became a co-founder of the Popular Will centrist party. López, a Princeton-educated right-wing firebrand heavily involved in National Endowment for Democracy programs and elected as the mayor of a district in Caracas that was one of the wealthiest in the country. Lopez was a portrait of Venezuelan aristocracy, directly descended from his country’s first president. He was also the first cousin of Thor Halvorssen, founder of the US-based Human Rights Foundation Lopez, now under house arrest, reportedly acted as a mentor to him. The pair speak several times a day, according to Bloomberg, despite Lopez's detention. US diplomatic cables published by Wikileaks highlighted the fanatical tendencies that would ultimately lead to Popular Will’s marginalization. One cable identified Lopez as “a divisive figure within the opposition… often described as arrogant, vindictive, and power-hungry.” Others highlighted his obsession with street confrontations and his “uncompromising approach” as a source of tension with other opposition leaders who prioritized unity and participation in the country’s democratic institutions. In 2010-2015, Guaido was an aide of a National Assembly lawmaker. In February 2014, student demonstrators acting as shock troops for the exiled oligarchy erected violent barricades across the country, turning opposition-controlled quarters into no-go zones known as guarimbas. Guaidó was directly involved in the 2014 guarimbas. In fact, he tweeted video showing himself clad in a helmet and gas mask, surrounded by masked and armed elements that had shut down a highway that were engaging in a violent clash with the police. In 2015, Guaido was elected a member of the national Assembly himself. In 2018, he spearheaded the opposition coalition named the Democratic Unity Round Table (MUD). As a member of the Venezuelan parliament, Guaido headed an inspection commission investigating high-profile corruption cases, such as the Odebrecht construction company bribery case, involving officials of Maduro’s government. Odebrecht, the largest construction and development company in Latin America, admitted in 2016 that it had spent hundreds of thousands of dollars on bribes in 12 countries of the region to win government contracts. As deputy head of the parliament's domestic policy commission, he came forward with a so-called amnesty law, which introduced assistance measures for political prisoners. On 05 January 2019, Guaido was elected to head the Venezuelan National Assembly. Guaido’s rise was helped by a pact among opposition parties to take one-year turns leading the National Assembly, the only branch of government they control. According to local media, that happened largely by accident since virtually no other candidate could compete with Guaido at that moment. Popular Will party leader Leopoldo Lopez, a brilliant and charismatic opposition leader, had been under house arrest since 2017, while his right-hand man Freddy Guevara has been hiding from the authorities in the Chilean Embassy. The young congressman happened to be next in line. State security forces arrested Mr Guaido just days after his election, with video on Twitter allegedly showing men dragging him from a car. But he was released from detention hours later and travelled to a rally as scheduled. Just two weeks after taking over the parliament, Guaido proclaimed himself the acting head of the Bolivarian Republic. The United States was quick to recognize Guaido as the country's acting president and demanded that Maduro, whose presidency was deemed illegitimate by Washington, should prevent any forceful acts against the country's opposition. Maduro, in turn, reiterated that he was the country's constitutional president, legitimately elected by the Venezuelan citizens, and accused Guaido of being Washington's puppet.